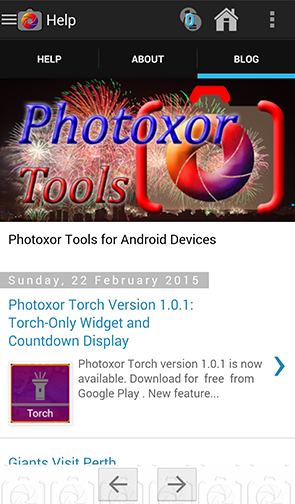 Photoxor C1 Version 1.4.8 is available now; upgrade or download for free. A Torch-Only 1x1 widget is available now. A Torch screen with auto-off countdown can be accessed from Navigation Drawer. A 'long click' on Map screen allows to set a location. If your a tight on screen space just use this new 1x1 widget to switch on / off the torch. It performs the same function as the Torch button on the full 4x1 Photoxor C1 widget. Have a try! Open the navigation drawer and look for the new Tools section. There is only one feature available for now, the torch. Click to open the torch screen. When you switch on the torch LED, a countdown timer shows the seconds left until automatic switch-off. Click on the countdown and the timer will be reset; a good function if you want to keep the torch on for a bit longer. Try a 'long click' of the countdown; this brings up settings where you could change the auto switch-off time. On the Map screen you are now able to visually define the 'current' location. Bring up the location on the map (zoom in for accuracy if needed) and do a 'long click'. A short vibration confirms that this point is now your new 'current' location with the blue marker set. As before, you are able to drag the marker to a different location, or click to save the location to your list of locations. The help tab now contains the new Blog screen to directly access this blog from within the application.